Next time you've hit one of your regular tee shots, walk 20 yards further down the fairway. It's a different game isn't it? 2. Swing on plane and the game of golf is easier. Takes a little work, but it's worth it. Any approach shot with a #6 or greater tests your ability to swing on plane. Those that swing off plane suffer with poor consistency and accuracy. 3. Why waste a good tee shot? Improve rhythm and distance control and scare your partners. 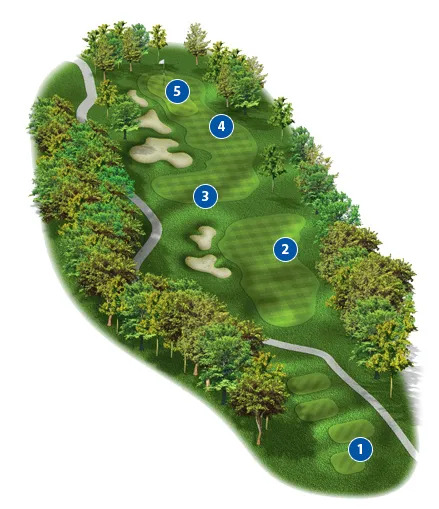 Hit your shots closer from 140 yards in and you'll give yourself more opportunities for a birdie. You don't need to swing hard. You need control. 4. Most golfers can drop at least 5 shots off their handicap by improving their short-game. The quickest way to go from 85 to 77, is to sharpen your ability from 40 yards in. The average golfer will face this shot 15 times in a round. 5. You averaged 35 - 37 putts per round what would your score be? On the green most golfers set up to miss! Most golfers struggle to control distance. Most golfers read greens poorly. 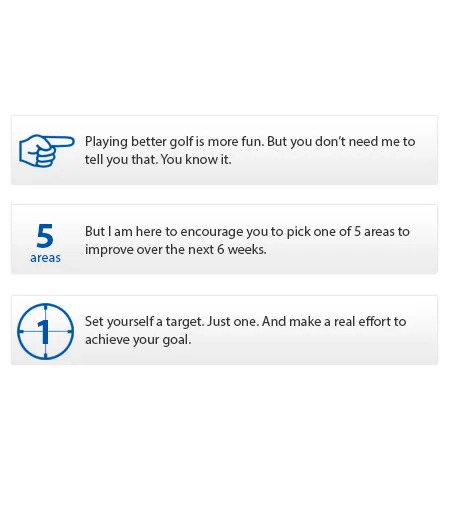 Most golfers can overcome all of these challenges.